Enpass is a cross-platform offline password management software that automates login process while keeping login information secure. It works on various browsers and platforms for both desktop and mobile devices. It uses open source AES encryption engine to safely protect all your sensitive credentials, supports time-based one time passwords and does not store any of your sensitive information on Enpass servers. Enpass even permits biometric authentication for unlocking the Enpass app. Although Enpass is an offline password manager, it permits syncing with cloud account of your choice, which means in case of loss or theft of your device, your secretive information is safely stored on your sync/cloud. The built-in password generator combines and creates strong passwords with a single click, without having to tax your brain. It even changes weak, old and duplicate passwords to strong, unique and complicated passwords which cannot be cracked. Moreover, with Enpass, you can even segregate your passwords for different work environments in different safety vaults for personal and business use. How much does Enpass cost ? The pricing for Enpass starts at $11.99. 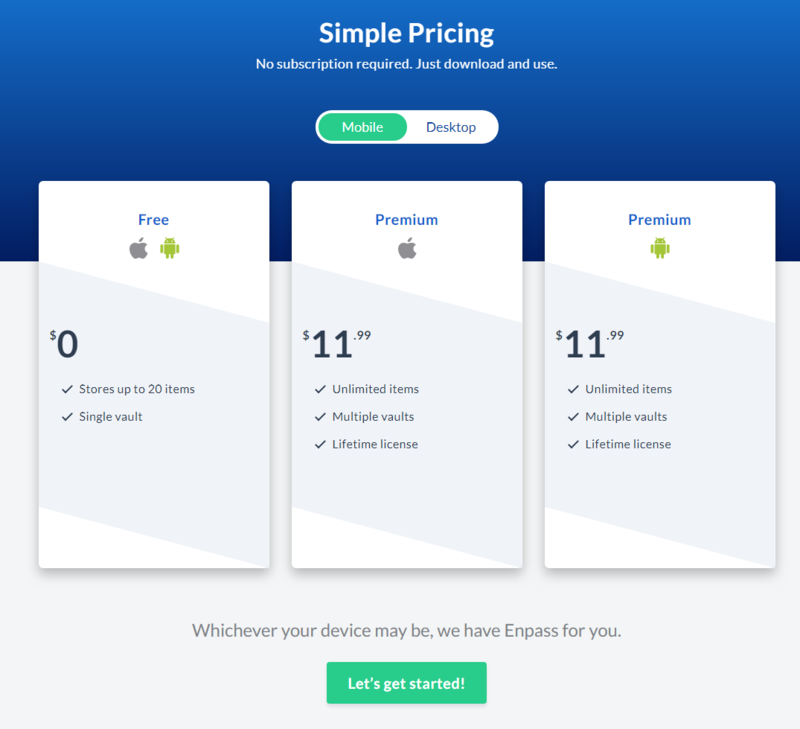 Enpass has a single plan - Premium at $11.99. Enpass also offers a Free Plan with limited features. "Password Management at its best"
Ease of use and software updates. I know all of my passwords are secure and accessible on multiple devices. Some issues with setting it up on a domain and file sharing. "Best Password manager in the market"
- There is a master password to keep all your secure notes safe. - There is a free version for desktop computer but I definitely recommend the paid version and they do great deals from time to time. Enpass helped me to keep all my personal passwords safe and allowed my to access them at anytime even when I am offline.
" Great Place to keep all Passwords!" Once you work hard to enter all important passwords, it is so easy to look them up and also to regenerate passwords thru the Enpass app. It might be a good idea to be able to print them all out in order to see if you have everything but I can also see where that would be a bad idea since you wish to keep them all private! This Enpass App will save time, be secure and also generate passwords for you! It is user-friendly and the best thing since sliced bread! It is quite safe to keep all the passwords needed for our company in Enpass instead of looking them up in a Word document! Much quicker and much more safe!!!! Having tried a few other paid password managers, I was pleasantly surprised by what Enpass offers for free. In addition to storing log in credentials and suggesting effective passwords, Enpass can sync with iCloud, Google Drive, Dropbox, and others. It can also communicate with web browsers via an installable extension. In the past year of using Enpass, I have not run into any issues. There is little fault to find with this application. At most, it could use a bit more flair in its presentation. It's impossible to beat the pricing of Enpass. If you are looking for an effective password management system and are trying to avoid upfront or subscription fees, Enpass is the full-featured solution you've been looking for. Having hundreds of usernames/passwords across the Internet, Enpass provides a great solution for keeping those accounts secure. "Secure and Simple Password. Management"
I like that I can store passwords for every aspect of my life in a single location. Before I was forced to switch between a few different password management strategies, and it was impossible to keep important information centralized. I don’t like that you’re limited to such a small number of entries unless you upgrade to the paid version. I also think that the interface could use more guidance. Enpass allows me to keep the numerous admin accounts I have to keep up with straight and organized. I appreciate having a secure and portable way to keep so much sensitive data on hand. Enpass is a free app. It may not be as good as other password apps out there but one of the reasons I like it best is because it covers all of the bases for me. It allows me to make the store my passwords for credit cards, websites, etc. You name it Enpass can do it. Enpass also has a very clean interface and is user friendly. I do think the security could be better for Enpass. Also, while the interface is clean it is not customizable. I think that if I were to own my own company I would use a more advanced password keeper and generator. Find out what kind of password keeper and generator you are looking for. Enpass is one of the best but lacks several advanced features. Enpass stores all of my passswords and it is like a reference book. I love this because many sites have different password requirements and I can always reference Enpass. "I love Enpass for it's robust encryption, great browser integrations, and ease of creating passwords"
I feel great knowing they use 256bit aes encryption. Beyond that the software integrations and different platforms they offer work fairly well. I use it on the iPhone, Chrome, Safari, Mac and Windows. I store my password db on Dropbox and that works flawlessly too. MacOS and Browser integration for touch ID is fairly buggy on Mac. In essence the password picker disappears when I try to use touch ID. The only way to get it back is to shrink chrome from fullscreen and then maximize it again. Honestly it's bad enough that I don't use touch ID on mac. Aside from that I occasionally have issues syncing with my dropbox account across devices. I'm not really sure if the is a dropbox or an enpass problem though. Don't expect it to be perfect, especially compared to onepass, but it is a lot less expensive and it works well. Managing both personal and professional passwords on all my devices is really easy. It also allows me to create robust and long passwords that I don't have to remember. I love how simple this app is. It does what it promises and does it well. No premium versions, no in app purchases or upgrades or annual/monthly fees. Have been using it for 3 years now and have had no complains. I think the web extensions could use a bit of work. Also the interface looks a bit dated. I have tons of passwords, each different from the other and expiring at different intervals. Enpass helps me track them all. Enpass has a great keyboard shortcut for populating passwords into forms. Alternatively, you can click the Enpass icon and search for any needed password on the fly. Also, when creating a new password for an account online, it does a pretty good job of detecting this and offering to save the password. It's a smooth experience. Very little. The current version will crash occasionally if not launched as an administrator. But it's not so often that it's a deal breaker. The interface is a little old and tired, but not bad. I hope the next version, which is in beta at the time of this writing, will solve these issues. I know the new interface looks great. It's password management made simple and easy. It's got great features and customization, and it allows for multiple ways to accomplish your goals depending on your preferences. It makes it much easier to login to the various accounts I need to maintain for my business. Enpass is also very secure so I don't worry about the data being hacked.